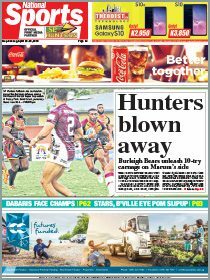 THE SP PNG Hunters will not need much motivation to win when they take on the CQ Capras in Emerald, Queensland tomorrow. The Rockhampton-based Intrust Super Cup side beat the Hunters 38-22 in the final match of the 2018 regular season, knocking coach Michael Marum’s men out of the finals that season and denying the 2017 champions a chance to defend their title. The Hunters are also winless five rounds into the 2019 season and a loss at McIndoe Park would see the South Pacific Brewery-sponsored team stay anchored to the bottom of the ladder and become favourites for the wooden spoon. 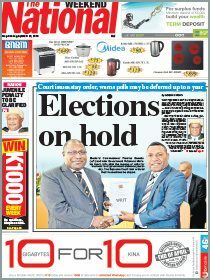 Marum has kept reshuffling his deck from the opening round and this weekend’s edition has another rookie in Jerry Teme partnering up with Ase Boas in the halves. The other changes to the line-up sees a new centre combination with Bland Abavu and Brandon Nima, pictured, holding down the three-quarters while experienced forwards Moses Meninga and Stanton Albert return the team. Marum has maintained that the Hunters system will produce results with the team needing time to find its feet but even five weeks of failure would be wearing thin on the club and its fans. The Hunters will also need to adjust to the logistical challenge of travelling to Emerald which is 270km by road west of Rockhampton. The Hunters left for Brisbane yesterday and fly to Rockhampton today before traveling by bus to Emerald tomorrow with Marum saying the team would virtually be stepping off the bus to the change rooms and onto the field for the evening match. The Capras, who were thrashed 44-12 by competition leaders Easts Tigers last round, have former NRL player Matthew Wright at fullback, centre Nathan Bassani and five-eighth Maipele Morseu as their players expected to feature prominently. Prop Chalice Atoi, who is part Papua New Guinean, will be another Capras player to watch out for. Marum said the long trip coupled with the history between the two sides would make for an interesting but crucial clash. “It’ll be a tough one but we are taking a side with some experience and ability so we’re prepared as well as we can be for the game,” Marum said. Marum said he was still looking for a settled winning side and every game was a test. “Every week we pick a team, we always put up the best we have but it’s been tough after five losses. Even the Dolphins, who won the comp last year have a win. Marum said having a squad with half of it made up of rookies was challenging because every game was essentially a trial for the new players. SP Hunters: 1. Joe Joshua, 2. Junior Rau, 3. Bland Abavu, 4. Brandon Nima, 5.Brendon Gotuno, 6.Ase Boas (vc), 7. Jerry Teme, 8. Moses Meninga (c), 9. Woods Kawage, 10. Dilbert Isaac, 11. McKenzie Yei, 12. Epel Kapinias, 13. Junior Rop; Interchange: 14. Charlie Simon, 15. Joe Frank, 16. Stanton Albert, 17. Enoch Maki, 18. Adex Wera. Fixtures: Rd 6 – Sat, April 13: Falcons v Tigers, Blackhawks v Dolphins, Bears v WM Seagulls, Pride v Magpies, Capras v Hunters; Sun, April 14: Jets v Devils.